Grilled skin side down, domed until cooked through, this salmon will melt in your mouth! SUPER MOIST! Preheat the grill pan over medium heat. Drizzle the salmon with olive oil. 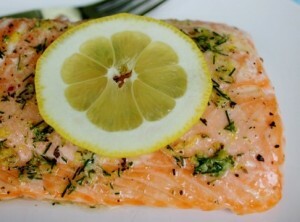 Sprinkle with a light coating of dill, garlic salt, pepper, and zest. Grill skin side down and dome with a large metal bowl or lid. Depending on the size, the fillet should cook through in about 10 minutes per pound. Serve with or without the skin. Garnish the plate with a lemon wedge.